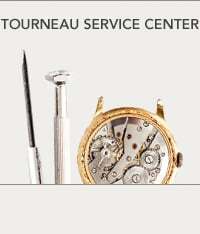 When you sell to Tourneau, you sell to the #1 trusted source for unparalleled expertise, value, and service. We offer you the option to get a check in the mail or receive store credit for 20% more towards a trade-in. Tourneau purchases high quality, luxury timepieces of the top brands that include Rolex, Cartier, Patek Philippe, IWC, Omega, Breitling, Panerai, Jaeger-LeCoultre, and more. Please submit online or bring your watch to one of our retail store locations to see what we can offer you. Unfortunately, at this time we do not ship to and from international addresses. If you are visiting the US, we encourage you to visit one of our store locations and speak to a manager. Can I sell more than one watch at a time? Yes. When it comes time to ship, we will send you one pre-paid, fully insured UPS label for all of your watches. Once you have accepted our offer range, we will e-mail you a pre-paid, fully insured UPS shipping label for all watches you plan to sell. Pack your timepiece(s) securely, affix the label to the outside of the shipping box, and drop it off at your nearest UPS Facility or a UPS Store. To find your closest UPS Customer Center, please click here. Why is selling my watch to Tourneau risk free? Do you insure my watch? Yes. We will insure your watch for the maximum amount of our offer range. In the unlikely event that something should happen to your watch because of the shipping carrier, you will receive the maximum value for it. What steps can I take to ensure that my watch will arrive safely? 3. Only drop it off at authorized UPS customer centers, or a UPS store. To find your closest UPS Customer Center, please click here. What does Tourneau do with my personal information? What if I decide to no longer sell my watch after beginning the selling process? The value of your watch is mainly determined by the current demand in the pre-owned marketplace. Using our extensive knowledge of the watch industry, we are able to establish a fair and competitive value for any timepiece. We always do our best to offer you the greatest value for your timepiece, so if you’ve been offered a higher price elsewhere, please let us know. Why is there a range of your offer price? Yes. Unfortunately, due to changing market conditions, our offer ranges are valid for 30 days from when the offer is made. After that time, you must resubmit your timepiece to us. Can I trade-in my watch for a brand new one? Yes. You can trade in your watch in one of our stores and receive store credit for 20% more than your watch’s value. 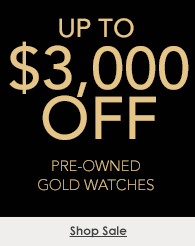 This can be used towards a brand new or certified pre-owned watch. Please find a store nearest to you. Are there any exclusions on the "store credit for 20% more towards a trade-in" offer? The offer to receive a store credit for 20% more towards a trade-in is considered a promotion, and therefore cannot be combined with other promotions, including Financing through the Tourneau Credit Card. Other exclusions may apply, please see a store associate for details. Why wasn’t my watch accepted? What happens after I send in my watch to you? Once your watch arrives at our facility in New York, one of our expert technicians will perform a detailed examination to determine the final value of your timepiece. We will make our final offer to you within 2 business days. If you accept, we will process your transaction immediately. If you decline, we will ship your watch back to you with no questions asked. Please email us any time at SellYourWatch@tourneau.com. What can I sell at the buying events? We happily accept fine watches in good to excellent condition. Once our final offer is accepted and processing begins, it may take up to 5 business days before your check is mailed. You can check on the process at any time by emailing us at SellYourWatch@tourneau.com. Do I have to wait to receive payment at the buying events? No. You will receive payment immediately at a buying event. No, we purchase watches directly from sellers. We do not accept consignment pieces at this time.